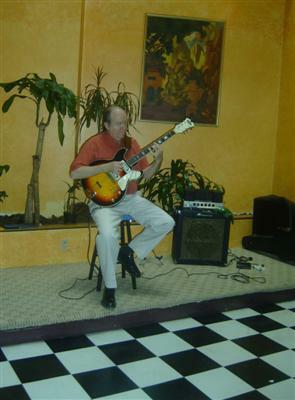 During his twenty-five years of teaching guitar at Berklee College of Music, Steve developed his pick-and-finger style of playing, borrowing from jazz, rock, blues, and classical music. Listen to Steve and you'll hear the melody singing out over chords and bass lines, with a little percussion thrown in for good measure. "Softly As in a Morning Sunrise"
Just released! Steve's 2 new CDs! A sublime solo guitar disc that highlights Carter's warm sound and thoughtful solo work on an extended collection of standards. 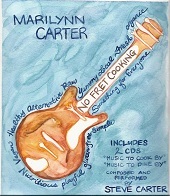 Carter, who's been heard at local venues such as the Crescent City Bistro in Dover, is a fluid player with a keen sense of melodic development that doesn't succumb to virtuoso pyrotechnics. Tunes range from Billie Holiday's "God Bless the Child" to Herbie Hancock's "Dolphin Dance" to Jobim's "Once I Loved." A fine set by an equally fine musician. - Alan Chase, "Jazz Universe", The Wire, New Hampshire Read the review. His guitar skills are impeccable, and he makes listening to solo guitar enjoyable...this guy's solo guitar is worth a listen. It also serves well for quiet moments of introspection and intimate thoughts. - Sheldon T. Nunn, JazzReview.com Read the review. An intimate conversation between Steve and the listening audience as he presents to us one man's love of the guitar, the American Popular song, and how great both go together. Especially when played by a superb talent like Steve Carter. - Lyle Robinson, JazzGuitarLife.com Read the review.